On the ACT Math Test, the trigonometry questions make up no more than 10 percent of the test, so if you haven’t had trig yet, don’t despair. At least half of the trig questions are very basic, covering trig ratios and basic trig identities. Here are a couple of sample questions for you to practice. 1. 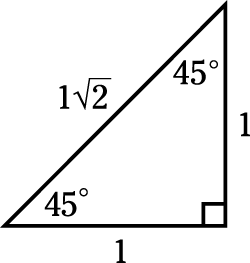 A right triangle has an angle with a degree measure of 45. Find the tangent of the 45-degree angle. Two similar triangles have bases of 5 and 25. Which of the following expresses the ratio of the areas of the two triangles? 1. The correct answer is Choice (E). First draw a 45:45:90 triangle. where s stands for the length of the side. Then figure out the tan by using the TOA part of SOH CAH TOA. If you picked Choice (A), you tried to find the ratio of the hypotenuse to one of the other sides, which isn’t one of the three main trig ratios. Choice (B) is what you’d get if you were asked to find the sine or cosine of the 45-degree angle. 2. The correct answer is Choice (H). which is the same as 1:25.